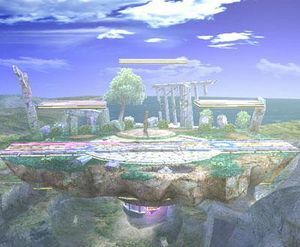 Super Smash Bros. Brawl has one of the largest collection of stages in fighting game, and unlike most fighting games, these stages aren't just pretty backgrounds. 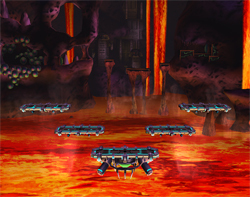 Each stage has its own unique layout and features that spices up gameplay. From the stable static platform that is Final Destination to an all out war on Mario Bros., it each stage requires a certain strategy in order to take advantage of its dynamics and avoid its hazards. Along with specific stage strategies, these stage descriptions will also provide you with information about the stage's legality in competitive tournaments, which can be useful if you're ever interested in joining one. Starter stages are stages that give minimal advantages to any character, and are the only stages that can be picked in the first match of a set. Counterpick stages are stages that gives a noticeable advantage to certain types of characters. 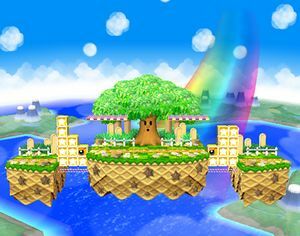 These stages are only available after the first match of a set, where the loser of a previous match gets to choose from a larger selection of stages so as to gain an advantage. Banned stages are usually completely banned in most tourneys, either because it gives an overwhelming advantage to a certain character or degenerates gameplay. Some tournaments might have a rule that allows a banned stage to be played if all players agree to play on the stage, but this is rare. Stage legality is a hotly-debated and controversial topic among competitive players and tournament hosts, so expect these ratings to change with time. A final note is that these ratings do not affect you at all if you do not wish to go to tourneys, so you can simply ignore them if you're not the competitive type. Many new stages will appear in SSBB, these are all the stages appearing in the game. How to unlock: Play 20 Vs. matches as DK. 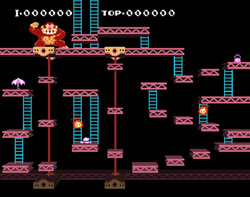 This stage is based on the third stage of Donkey Kong, though its layout is more loyal to the NES port of the arcade version. It has a lot of platforms and climbable ladders, as well as little enemies called Trouble Bugs that move along platforms and can climb ladders. Occasionally, a hat, a parasol or a bag may appear somewhere on the stage which can be collected, but doing so does nothing that affects gameplay. 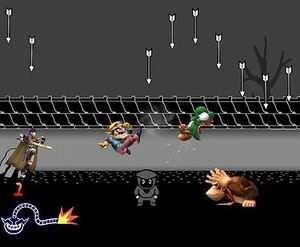 At certain points during the match, a different song will start playing and the Donkey Kong sprite will move to the foreground, becoming a stage hazard that deals strong damage and knockback. Springs will also bounce across the top platform and fall off at certain points near the end, hurting any player who comes into contact with it. Despite it being one of the largest stages in the game, the sheer number of platforms can make it awkward to move around, often making the stage feel cramped. If you want to avoid most of the hazards and have an easier time KOing, the best place to be is at the top right corner, where springs won't reach you and where you're very close to the blastline. You can try knocking your opponents into Donkey Kong or the springs to attempt a KO, but smart opponents will usually avoid that. This stage is universally Banned due to a lot of factors. It lacks a main stage area, has walkoffs, has very strong stage hazards, lots of grabbable ledges and awkward layout makes it a very uncompetitive stage to play on. 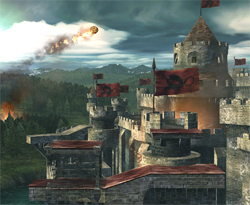 The Battlefield stage is one of the most basic stages in the game and a staple of the Super Smash Bros. series. This time around, rather than floating in a dark void, the level has an ancient ruins theme and floats above a large valley. The time of day changes during gameplay, with the sun rising and setting at regular intervals. 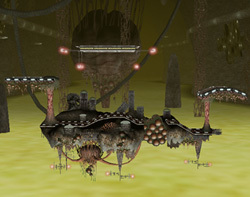 The theme is not borrowed from any specific game, although its design resembles the architecture of the Ancient Ruins in the Subspace Emissary. The stage consists of a large solid platform as a base and three platforms aligned in a pyramid above the base. The platforms can be used to chase and help in combos. It also gives more recovery options, letting certain characters recover straight onto a platform safely instead of the ledge. The awkward edges of the SSBM Battlefield was also replaced with a thicker, slanted ledge, a change characters like Fox will appreciate. The sides can be wall-jumped from. Having a good knowledge of how your character synergizes with platforms is very helpful on this stage. Almost trivial tidbits of information, like how Bowser's Up Smash can hit through platforms, can be very helpful to you. Battlefield is always considered a Starter stage and is a prime example of what a starter stage is. It gives no obvious advantages to any character, and has no hazards at all. The stage begins in the hangar of Meta Knight's ship, the Halberd, which is just one flat stage with walkoff blastlines. After 12 seconds, a hatch opens up and lets a platform take off at the same time as the Halberd. This stage layout includes a main platform that can be passed through from below but not above, with a lower middle section. A smaller platform hovers above the low ground. The platform arrangement eventually lands on the bridge of the Halberd, which is a flat arena with a floating platform at the middle. Players will be routinely attacked by the ship's Combo Cannon. The cannon has several attacks. It can launch a flashing cannonball that slowly falls to the stage, which deals tons of damage and knockback. It can also fire a strong beam that requires some time to target a player, then hits multiple times, with the final pulse dealing all the knockback. It's final attack is lunging at a player. The hazards on this stage are generally easy enough to predict and avoid. The cannonball is very easy to dodge due to its poor speed. The laser can easily be anticipated, but is you're ever caught in it, use SDI as if you're caught in a Smart Bomb and you can escape before the strongest laser pulse. It can also serve as a barrier against physical attacks, as enemies are more hesitant to attack you when you're separated by a huge beam. The hardest attack to avoid is probably the mechanical arm. It gives plenty of warning that its about to attack by flailing around, but the actual attack is incredibly fast, and does enough knockback to kill. Shield it or dodge it as soon as it lunges to prevent yourself from getting hit. When the platform is flying, some characters like Metaknight can "shark" their opponents, which is the act of attacking from beneath the main platform. It can be very annoying for less-mobile characters to deal with, but it's also risky for the sharking player. It should be noted that the top blastline for the flying platform arrangement is slightly lower than average, so upward attacks are more effective if you aren't going for an edgeguard. This stage is universally considered a Counterpick, but it can be seen as a Starter stage for tourneys with large starter stage lists. The hazards don't affect the fight too much, but the stage does give a slight advantage to aerial characters. The Bridge of Eldin is exactly that, a long flat platform that stretches across a large chasm. There are walkoffs to the blastline at the edges. Every once in a while, a horn will blow, signalling the arrival of King Bulblin, who will deal damage and knockback to players in his way. He will drop a large bomb that will destroy the middle of the stage as well as damaging and dealing knockback to players to close to it. Attacking King Bulblin enough times will prevent him from dropping the bomb. Occasionally, a bulblin will follow behind King Bulblin and gets knocked off as it reaches the bomb. Players can also attack it to slow its movement and knock it off the stage, but doing so does nothing. After a while, a twilight portal will appear, repairing the stage back to its original state. The long, flat nature of the stage makes it perfect for characters with projectiles, who can camp very easily as opponents don't have a way to avoid these projectiles or approach. 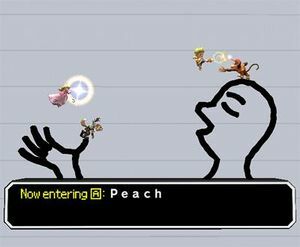 The walkoffs at the edge can also be camped by characters with good chaingrabs such as King Dedede, who can chaingrab certain characters right into the blastline for an easy stock. The stage's hazards are easy enough to avoid, but you can knock opponents into them for a potential KO. The stage also has some well-known glitches involving using Final Smashes while the stage is being repaired, such as causing the user to be stuck in the Final Smash state. This stage is universally Banned in tourneys as gameplay can easily degenerate due to projectile camping and walkoff camping. Midst of Battle — The midst of battle is the scene the stage starts out in. It has a slanted main platforms with two small platforms at each side. Throne Room — The throne room features a no bottom blastline and walkoffs. There are also two statues holding two platforms that can be destroyed. Two more platforms are located at the two top corners angled at the edge of the stage. Underground — The underground is a typical underground area surrounded by magma. The stage itself is a balanced rock pillar with a small elevated section. The platform tilts slightly over time in different directions. During the first stage, players tend to be more aggressive as the area is quite small, giving very little space to camp. The closeness of the small platforms to the main one also allows players to chase their opponents and follow up with combos. The edges are slightly longer than the base below, which can screw up some character's recoveries The second stage favors chaingrab characters like King Dedede a bit, who can camp near the edge and chaingrab any character he catches off the edge for an easy KO. The statues will block projectiles, so characters with difficulty approaching these opponents can use the statues as a shield. The statues can also be used to extend the duration and range of most attacks, allowing for some interesting tricks. The strategy for the third stage is similar to Final Destination, but the tilting of the platform and the slight bump near the center and disrupt chaingrabs and projectile camping. This tilting feature can also mess up recoveries. The transition stages also have walkoffs and is totally flat, but never lasts long enough to seriously affect the match. This stage is often considered a Counterpick and is also found as a Starter for tournaments with larger starter lists. 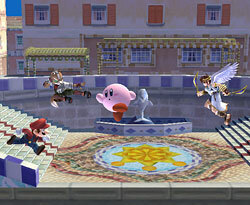 The stage variations benefit different types of characters and put other types at a disadvantage. The hazards also minimally affect gameplay. Delfino Plaza takes place at the largest city of the tropical paradise that is Isle Delfino. 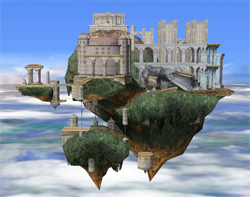 Players start out on top of a flying arrangement of platforms which gives them an aerial tour of the whole area, landing for a short while in certain landmarks which serve as different stage layouts. The hovering platforms alone have a variety of arrangements that change every time they return. The stage will always have a main base that can be passed through from below. Below are all the possible layouts. One flat platform above the main one and a larger, arcing platform above it. The stage starts with this. Two platforms slanting downward toward the middle of the main platform, with a straight center platform above those two. Two small platforms around the ledge and one small platform in the middle above the others. One small platform above the left side of the main stage and another slightly higher above the right. The boardwalk at the main courtyard, which is just one flat platform with water below the ledges. The platform will also land in an area around the western side of the plaza, which has a lowered spot with shallow water and a veranda that can be stood on, as well as a spot of deep water to the far right. Along a line of umbrellas near the Shine Gate. The Shine Gate with two small platforms attached near its tip. The area in front of a dolphin statue where Mario could teleport to Noki Bay in Super Mario Sunshine, which has a low central area with stairs leading to walkoffs at both sides. On top of several rock columns with water underneath. Two different islands, both having almost similar terrain, but different sizes. These different stage variations are all static, so memorizing their layouts is not too important for victory. Characters can shark below the main hovering platform, which can be difficult to deal with. Most landing spots have water that can be swam in, which can save players from meteor smashes, but can also make them more susceptible to meteor smashes. Some landing spots have walls and walkoffs which can be taken advantage by certain characters to camp or perform wall infinites, so be careful if you're fighting against one. Overall, the strategies for all layouts are almost the same. This stage is universally considered as a Counterpick, as it has manageable hazards and most layouts are neutral enough. It is sometimes chosen as a Starter stage for tourneys with larger starter stagelists. 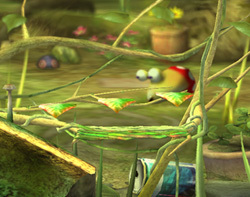 This stage takes place on the planet where the story of Pikmin was set in. It consists of a main platform made of vines that reacts to players standing on it, but the gameplay effect is minor. There are three leaf platforms above the base, which will gradually lower the longer a player stands on it. The left side of the stage possesses a rock slope. Frequently, rain will fall and push players off the slope and down the bottom blastline, but the ledge can be grabbed, saving them from an SD. A Bulborb will occasionally appear at the right of the stage. It serves as a platform normally, but when it opens its mouth to yawn, falling into its mouth will cause it to eat the player and cause an instant KO. Pellet posies and onions will also appear on certain parts of the stage. The pellet posies can be attacked to drop pellets, which act as throwable items that hurt enemies depending on the number on the pellet. The pellets can also be thrown into an onion to get items. The higher the number on the pellet, the more items it will give out, and even more if the pellet and the onion are of the same colour. 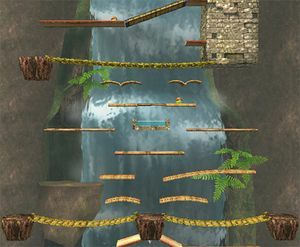 Like every stage with a platform that can be passed through from below, aerial characters can shark through the main platform, making it hard for their foes to counter attack. The left slope can let some characters chaingrab others up the slope, but the uneven terrain and occasional rainfall will interrupt it. The bulborb is generally never too much of a concern if you choose to ignore it, but you can knock enemies into it for a potential KO. 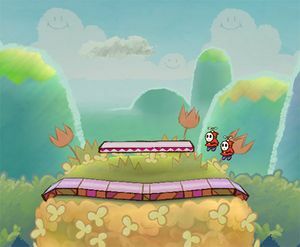 Faster characters can also outmaneuver slower ones by weaving along the platforms and jumping from the bottom of the slope to the other part of the stage, a technique commonly known as "circle-camping". An advantageous position is at the bottom of the rock slope. Opponents will have a hard time attacking you and you can easily avoid their attacks. If rain falls when you're in that position, you can also easily grab the ledge. Finally, the pellets can be used as makeshift projectiles for characters that don't have one, but you can also use it to generate items. This stage's legality is quite controversial. It is usually Banned due to circle-camping, sharking and the advantageous position the slope gives. It is occasionally Counterpick for tournaments with larger stage lists. This is the simplest stage in the game. It is just one large platform with a background that changes from an odyssey through space to a sunset above a vast ocean. This is also the stage where you must fight Master Hand and/or Crazy Hand in Classic Mode and Boss Battles. Compared to the same stage in Melee, it is slightly smaller, and the base is thinner. Thanks to its lack of platforms, gameplay is fairly linear and can even feel a bit restricted. Without platforms, characters have more limited recovery options, as they must aim for the ledge or close to it to be safe from attacks. 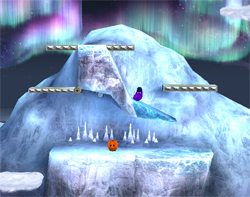 It gives a significant advantage for characters with strong projectile-camping abilities or good chaingrabs, such as Falco, Diddy and Ice Climbers, because there is no alternative way to approach due to the lack of platforms and a long stretch of ground for characters to chaingrab across the stage for high damage. Diddy Kong is listed as an example because he can control the areas of the stage with his bananas, and since there are nowhere to land other than the platform with bananas, it lets him restricts the movements of his foes with ease. The ledges have a slight extension with a tendency to snag players from properly grabbing the edge, so be careful when recovering. Final Destination have been considered a Starter stage for a few years, but some regions have begun to list it as a Counterpick because of the advantages it gives to projectile and chaingrab characters. 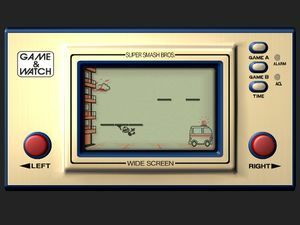 This stage takes place in a widescreen Game & Watch device, and will frequently shift between different Game & Watch titles, about once every 30 seconds. The stage will go through all of the variations in a random pattern, so other than Fire, no variation will appear twice before all the others have been shown. 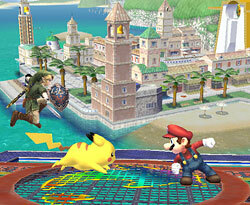 The stage transitions are indicated by a Game & Watch character appearing at the side of the screen ringing a bell. There are four different stage variations, each with their own hazards. Fire: This is the layout the stage starts with, and other variations will always revert to this one before switching to a different variation. 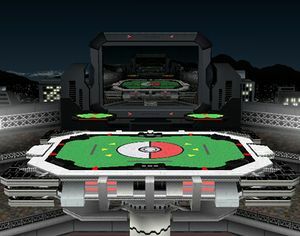 The stage consists of several platforms, with random additional platforms held by the character from Manhole, similar to the original Flat Zone. The firemen's trampoline can be jumped on to launch yourself much higher, while the floors of the building on the left serve as platforms. Note that the firemen will only appear if there are no floating platforms. Oil Panic: This stage consists of a gas station with multiple levels. There are two people whose position will constantly shift. Attacking these people will cause them to attack back, dealing moderate damage and knockback to players, even ones that didn't cause them to counterattack. Lion: This stage consists of a large cage with three levels. Characters can pass through the top of the cage from below but can't drop down into it. Two lion tamers guard each side of the cage and will constantly shift from level to level. They do massive damage and knockback to players, and will usually knock them into each other, causing them to be stuck in a deadly loop. Chef: This stage consists of two sets of platforms that randomly change positions. The chef will constantly toss food items, which will deal minor damage and knockback to anyone it hits. The chef can be knocked away with enough damage, which will also force a stage transition prematurely. The stage also have walkoffs and very close blastlines. In addition to this, the stage has an interesting cosmetic feature. All of the characters and objects on the stage are two-dimensional, although some visual effects are still rendered in 3D. Due to the small size of the stage and the amount of hazards, gameplay on this stage tends to be very chaotic. You must either learn to avoid the hazards, or exploit them to help you KO your opponents. Due to the walkoffs, characters with chaingrabs can get easy KOs by chaingrabbing opponents straight into the blastline. The close blastlines is also very helpful for characters who normally have trouble killing, as even a moderately strong attack can KO surprisingly early on this stage. This stage is universally Banned in tourneys due to its walkoffs, small size and high threat of its hazards. Appears after Mr. Game & Watch is unlocked. 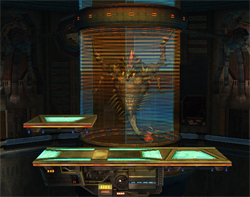 This is a stage based on the battle against the Parasite Queen in Metroid Prime, but the boss is just a background element in this game, and doesn't interact with players. Every so often, a siren will sound for a few moments before the stage flips 180 degrees, making you fight in a different layout of the stage, before eventually flipping back. The starting layout consists of a main, flat platform with a smaller platform above its left side, with a moving platform that shifts up and down on its right. Only the left edge is grabbable in this version of the stage. The layout after the flip is a large platform which is straight near the ledges but is concave at the middle. One platform floats above the indentation, while smaller platforms will move left and right near both ledges. Stage control is vital in this stage. 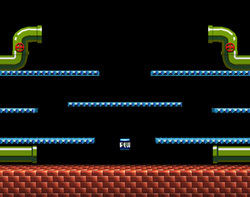 The left portion of the first stage with the platforms is a useful position to hold as it gives you a platfom to escape projectiles and chaingrabs. The right section of the stage is disadvantageous to be in, since you can't grab its ledge, though you can dodge projectiles when the moving platform move downwards. It also creates a temporary wall while it is at its lowest position, which can let you do some combos and chaingrabs against the wall. The flipped stage emphasizes control over the edges to give you a height advantage, but the indentation can let you dodge projectiles. A character camping in the middle can be difficult to approach if played well. The moving platforms off to the side can aid in recovering. Note that you might find yourself in an awkward position after a flip, so it is generally advisable to stay in the air as the flip is going on. The stage is universally considered a Counterpick as certain characters can control certain portions of the stage very well. This stage is a 3D recreation of the first level of Sonic the Hedgehog, even including the entire layout of the level offscreen. It is flat at the edges with a half pipe in the middle, and has walkoffs at both sides. Certain sections of the half pipe may break after enough attacks, creating a gap that characters can fall through and get KOed. Occasionally, characters from the series will make a cameo running across the half pipe track. During the match, "checkpoints" from the sonic series will pop up. They're harmless when blue, but any attack will cause them to spin, hurting players except the one that caused it to spin. The half pipe shape of the shape tends to make battles a bit awkward, as it is a bit difficult to hit certain attacks when your opponents are lower than you. The checkpoints are a very useful defensive hazard that you can activate and turtle beside, as it is very hard for enemies without projectiles to hit you without getting knocked back. Like other stages with walkoffs, certain characters can chaingrab their foes off the stage for an easy KO. You can also camp at the edge and throw anyone that spproaches into the blastline, but you have a high risk of getting KO yourself. This stage is universally Banned due to the effectiveness of camping the half pipe and the defensive power of the checkpoints. Appears after Sonic is unlocked. 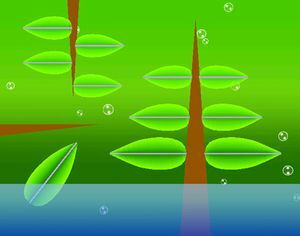 An odd plant themed stage, taken from the game Electroplankton. This stage has no main platform, instead all the leaves serve as platforms with grabbable edges. These leaves will shift their position and change their color when attacked, or when Elektroplankton land on them. The stage has water, but it is only a cosmetic feature and cannot be swam in. If all the leaves on the right stem are red at the same time, a flower will sprout on top of the stem. Due to the odd layout of the stage, gameplay will be very different compared to other stages. You will be hopping around platforms often, so pick a character with good aerial mobility if you want an advantage. The arrangement of the platforms means you can run circles around slower opponents while racking up bits of damage. The nature of the platforms can mess up certain recoveries like Ike's Aether, so be more careful when making your way back to the stage. This stage is universally Banned as the layout promotes circle-camping and the huge change in gameplay and strategy. 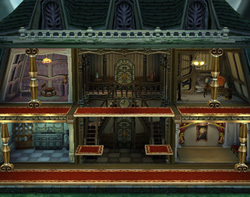 This stage takes place in a smaller version of the mansion Luigi explored in the game of the same name. The house has two floors and a roof. The two floors are connected in the center by a passable platform. The mansion is composed of four sections, two on the first floor and two on the second, held up by pillars. After absorbing a few attacks, the pillars will give way, causing that section of the house to collapse. When the whole mansion collapses, the stage is similar to Final Destination. The mansion will regenerate once it is fully destroyed, but keeping a few sections standing will keep it from fully repairing itself. Occasionally, two vertically moving platforms will appear off the edge of the stage. The stage has relatively far blastline, so KOs are a bit harder. The pillars in the mansion is a very helpful tool if you're up against projectile users, as it acts as a shield that protects you from them. The ceiling on the first floor creates a "cave of life" effect, since it stops you from getting KOed off the top, so it is a good place to stay if you're near death. It also sets up certain chains for some characters, like jab cancel combos or forced getups, since a strong upward attack will leave its target lying on the floor. If you find some of the mansion's features annoying, such as the pillars absorbing your projectiles, it is best to leave at least one section of the mansion undamaged so it won't regenerate. Inversely, if you need the pillar shields and the cave of life the mansion offers, destroy any remaining sections of the mansion so that they will respawn quickly. This stage is universally Banned due to the ceiling of the first floor which can be exploited to survive longer or setup certain unescapable loops. Play three Vs. matches as Luigi. 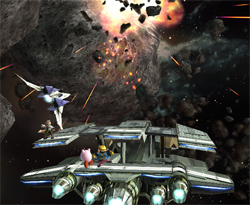 The Lylat Cruiser stage has players fight on top of a spacecraft called Pleiades, which doesn't appear in the Star Fox series. It has one main platform and three platforms attached to the ship, with the sides of the stage slightly slanted. The stage itself will warp to four different areas: a heated battle between giant spacecraft, a precarious journey through an asteroid field, a dogfight between Star Fox and Star Wolf and the peaceful outer atmosphere of Corneria. The stage will tilt based on a set path depending on the current background, but it will always be level during the warping sequences. When using Fox, Falco or Wolf, using a smash taunt will trigger a conversation between Star Fox characters by the next background change. The event is different depending on which character you used and what background event you warped to. 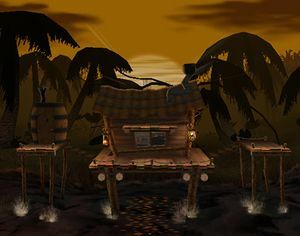 The slanted and tilting feature of the stage can interrupt chaingrabs and projectile camping. As the platforms are quite close to the main platform, most moves can hit through them. Platform canceling is possible during all background events except when it is above Corneria, which can extend some combos. The ledges are quite thin, and has a tendency to mess up recoveries, especially when the stage is tilting. The tilting and ledges of the stage is manageable enough that it is usually considered a Starter, though it becomes a Counterpick in more conservative stagelists. This stage is a faithful recreation of the original Mario Bros. arcade game, and even its gameplay resembles the game it came from. There are multiple floors on the stage which can be bumped from below. The top pipes will spawn enemies which will move along the stage and exit through the bottom pipe. The turtle enemies are called Shellcreepers and take one hit to flip, but will change color, move faster and become deadlier if they recover after being flipped. There are also crab enemies called Sidesteppers which are faster and more powerful than Shellcreepers and take two hits to flip. They also change color and gain speed and power if they recover after being flipped. These enemies can be flipped by normal attacks or by bumping them from below, after which they can be picked up and used as a powerful throwing item. There will be a POW block in the center of the first floor that serves as a platform and will knock over all the tiny enemies when attacked or jumped into. It dissapears after three uses, and reappears in exactly 30 seconds. Lastly, fireballs will randomly appear from each side on all levels. They will move in a zig-zag pattern across the tier it appears on before dissapearing again. Toushing the fireball will hurt the player. This stage has a fixed camera, so you can see all of the stage at any time. The many floors on this stage makes it difficult to get KOs normally, so you have to use the Shellcreepers and Sidesteppers as your main weapons. They do a ton of damage and knockback, and most of the gameplay on this stage consists of avoiding them and throwing them at your foes. If you don't want to be hit by these creatures, a good spot to hide would be behind the pipe entrances, as the enemies won't go beyond the pipes. Having a reflector is very helpful on this stage, since you can reflect the powerful creatures back at your opponents, knocking them away with their own attack. The platforms are thin enough that most attacks can pass through, letting you shark your enemies. This stage is universally Banned, but not because of the obvious reasons. Usual problems like circle-camping, walkoff camping and chaingrabs are negated due to the presence of the spawned enemies. In fact, it had been proven that the stage is competitive. The main reason it is banned is because of the sheer change in gameplay on the stage and because of the advantage characters with reflectors get. Complete Event 19: Wario Bros. 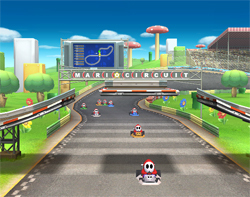 This stage is set on a race track that doesn't resemble any from the Mario Kart series, but does incorporate some elements from the series into it. The track is a simple figure 8 shape, even though most of the track is unviewable offscreen. The stage takes place in the intersection at the center of the track, with one long stretch of ground, two ramps on either side and one floating platform in the middle. Shy Guys in go-karts will frequently race past the fight, either crossing through the bottom or launching themselves off the ramps from the sides. These Shy Guys will hurt anything they collide with, though attacking them will cause them to spin out, temporarily eliminating them from the race. The racers should rarely ever be a problem, as you're given ample warning about when they will approach. You can try knocking your opponents into them for some additional damage, which is easier when they are coming from the sides. The stage has walkoffs, which you can camp in and throw any character that comes close into the blastline for a cheap KO. You do have a higher risk of getting KOed yourself in this position, and if you're a tall character you might even get hit by the karts. You can also chaingrab with certain characters into the blastline as another easy way to get KO, but it is generally considered a cheap tactic. This stage is universally Banned due to the walkoffs giving chaingrab characters too much of an advantage. 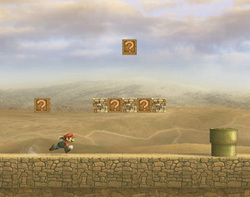 This stage recreates the first two levels of the orignial Super Mario Bros, but with a more abandoned feel, to signify how the original Mushroom Kingdom had been deserted since its release. Both stages have an equal chance of loading, but you can force the game to load World 1-1 by holding or or as you select the stage or hold or or for World 1-2. The stage slowly scrolls sideways, looping back to the beginning after the flagpole. The layout should be quite familiar to fans of the Mario series, as all the blocks, including the hidden ones, are exactly where they were in the original. The pipes are blocked off, so there are no hidden area to enter. The Warp Zone in World 1-2 is also removed. Brick blocks can be destroyed by attacks or by bumping into them, which won't regenerate until the next loop. Item blocks can be activated similarly but can't be destroyed, which will obviously grant random items if they are enabled in the Options. Like in the original, some Brick Blocks are actually Item Blocks in disguise. The stage scroll shouldn't be too much of a problem, as even the slowest characters can keep up with the scroll speed. The blocks and pipes can create walls that lets you perform combos or long chaingrabs, but they won't be onscreen long enough to be used a lot. Just like in the original game, you can reach and stay on the top blocks in World 1-2, effectively letting you hide from the battle below for most of the stage. Both levels of the stage are universally Banned due to the presences of permanent walkoffs and walls which can be abused to create inescapable KOs. World 1-2 is an even worse case due to the camping of the ceiling blocks. 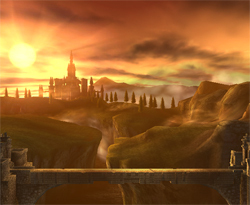 This stage is the largest in the game, and possibly the whole series, even bigger than the Hyrule: Temple stage in Super Smash Bros. Melee. With all the freedom to run this stage offers, you may pass some time chasing your opponent. This can tend to make fights involving anything less than four players to become a bit boring due to the sheer space and keepaway tactics. The stage can be split into three sections, the top-left, top-right and the bottom section. The top left is usually a bit harder to reach for characters like Link who have poor recoveries, but its layout is quite standard, with a few walls for wall-jumping and combos. The top-right contains a swinging platform and a bunch of smaller platforms. The bottom section is similar to Temple's "fight club", as the ceilings let you survive until ridiculously high percentages. It also contains a destroyable platform. Occasionally, a deadly creature called the "Ultimate Chimera" will appear on one of these three sections. Getting bitten by it will almost always be an instant KO, unless you manage to perform a well-timed tech when you hit a wall or ceiling. The Ultimate Chimera can only be defeated if it is standing on the breakable platform when it breaks, after which it will fall to its death. Just like in Temple, expect to chase your opponents around just to hit them, but you can also choose to play keepaway yourself. 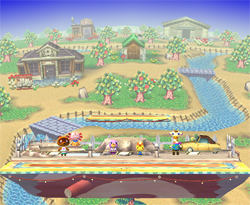 The layout of the stage lets a mobile character move between sections making it hard to catch them with slower characters. The walls can be used for wall combos and chaingrabs, but it is a bit unlikely to get you and your opponent right next to one. When the Ultimate Chimera appears, just fight in the section it didn't spawn in and you should be fine. You can try to knock enemies into it to score a KO, but your opponent might be thinking the same thing. If you are at a very high percentage and need to survive, go to the bottom section of the stage, as the ceilings help you survive a bit longer, but can also rebound you to your doom. Try to tech as you reach the ceiling or walls, as it can negate all knockback, letting you survive powerful blows at unrealistically high percentages. This stage is universally Banned and considered one of the most uncompetitive stages in the game. Its large size and bottom section makes KOs very difficult and encourages circle-camping, giving a big disadvantage to characters with weak KO power or poor mobility. The permanent walls can also be exploited to perform wall infinites. This stage is based off of one of the main areas in Metroid. There are 5 platforms arranged in a V position over a massive pool of lava. The platforms all have grabbable ledges. The lava frequently rises and falls, burning and knocking any player that touches it upwards. There will also occasionally be huge walls of lava that will cover half of the stage. These can coincide with the highest tide of the lava floor, leaving only one platform that is safe to stand on. There will also be lava flares which shoot from the back of the stage to the front, sometimes in several volleys of them. Finally, there will sometimes be a huge lava wave that will occur behind the stage and will cover the entire stage for a brief moment. A pod will spawn at the same time of the wave, along with a random item if enabled, and can be opened by attacks. Hiding in the pod grants players protection from the wave, but it also traps them inside the pod until the wave is over. The hazards can be a bit disruptive for gameplay, but they are still manageable to avoid. You should pick an aerial character if you want to have an advantage, as there isn't much ground especially when the lava reaches its peak. The multiple grabbable ledges means that you can repeatedly grant yourself invincibility and refresh your double jumps. The bottom platform is also advantageous as you can shark opponents on the higher platforms and because it is easy to anticipate an attack from above, but the top platforms are the safest place to be too avoid all the hazards. While it might seem counter-intuitive, the best thing to do when the giant lava wave appears is to ignore the pod. The wave might do a lot of knockback, but a simple shield or dodge can overcome it. Staying in the pod actually puts you at a disadvantage, as players who stayed outside the pod can attack you inside while the pod doors are still closed, repeatedly knocking you against the walls and racking up some easy damage. This stage is mostly Banned, but it is sometimes seen as a Counterpick. 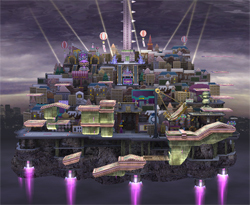 The multiple grabbable ledges and the layout of the platforms gives an advantage to aerial characters and can cause circle-camping, but the hazards actually lessen the problem since it discourages camping. Fires: Two drawings of flames around the center of the stage. It does low damage and knockback but is quite good at trapping and juggling characters against each other. Rockets: Two rockets which appear at the sides of the stage, one at the top-left, one at the bottom-right. The rockets will slowly move forward. Anyone that touches the rocket will take damage and be launched a set distance, sometimes right into the other rocket. Cart: A wide u-shaped platform with a cart that travels from one side to another. The cart deals damage and knockback to players it collides with, but it can be stood on similar to a Rolling Crate. Spikes: Spikes are drawn on the very edges of the stage. They so moderate damage and knockback to players touching them and can sometimes launch players from one set of spikes to the other. Boxes: A set of stacked boxes drawn in the middle of the stage. Movement in the boxes is a bit awkward due to the amount of walls. Springs: Two springs appear at both sides of the main platform. They will bounce characters that touch it back up, similar to the item of the same name. Ferris wheel: A ferris wheel made up of four platforms spin in a circle. Pendulum: A platform that constantly swings from side to side. Blowing face: A face appears at the right edge and blows strong winds, slowly pushing players back. Barn: Two platforms extend out of the main platform. A small building, a cow and some grass is also seen in the background. Pirahna Plant: A man-eating plant is drawn in the middle of the stage. It will do moderate and damage to players that touch its head. Whale: A whale appears, forming a huge platform. The water spout can also be stood on. Spears: Four spears jut out from the main platform. Touching the spearhead will make you take damage and moderate knockback. The stems act as walls. Clock: A clock appears in the background, with the hands of the clock acting as platforms. Split eyes: Two eyes appear in the background along with one solid platform/ceiling that seperates the stage in two. Angry eyes: Two eyes with an angry expression are drawn, with the eyebrows acting as platforms slanting toward the middle of the stage. Lines: A bunch of lines with varying length that act as oddly arranged platforms. Flags: Two flags appear at beside the main platform, with two platforms at their top. House: A house is drawn in the background with the roof as a platform. Scaffold: A platform that can be reached by two ladders. Dominoes: Five falling dominoes are drawn, acting as solid platforms. Person: A hand and a head is drawn, acting as solid platforms and walls. Tree: A large tree is drawn in the middle of the stage with branches above, to the left and to the right of the stem. The branches have leaves which act as platforms. Pine trees: Two pine trees are drawn. The stems are in the background but the leaves act as platforms. Platform: A simple line that acts as a platform. A half-cloud and a flag is seen in the background. Sailboat: A sailboat floating on top of water and within two pegs. Everything except the sails and mast can be stood on. Umbrella: An umbrella is drawn in the middle of the stage, with the top acting as a platform. Generally, you want to avoid the hazards or knock your opponents into them to rack some damage. The platforms can sometimes be arranged in an awkward way, so learn to move around them. Certain drawings have temporary walls which you can use to trap your opponents with attacks. Some drawings actually help you recover, like the barn drawing. Overall, it is a good idea to play on the stage a bit if you want to familiarize yourself with the drawings, so that you will be ready when each drawing appears. This stage is generally Banned, although it has occasionally became a Counterpick. The hazards have been argued to be too random and powerful, but the stage's supporters usually argue that the hazards are avoidable. 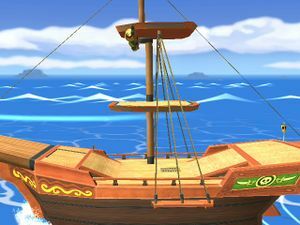 This stage takes place on Tetra's pirate ship, but certain events will add temporary hazards, platform or even alter physics. The ship has two smaller platforms around the middle of it, as well as a catapult that will occasionally fling players to the left with great force. Characters can swim in the water surrounding the boat, but will slowly be carried to the right by the current. Touching the front of the boat while in the water will result in getting knocked into the sea and an instant KO. The ship will occasionally pass by lookouts that will fire bombs at players. The bombs deal heavy knockback and damage at its center, but reduced damage and no knockback to any character caught by the splash. The King of Red Lions boat will sometimes appear behind the ship and acts as an additional platform. The ship can get shipwrecked on a rock following a short warning, drastically angling the ship and letting players fight on the rock. There will also be an occasional storm that will lift the ship into the air, temporarily removing the swimmable water, and reduces gravity as the ship falls back to the sea. Whe it comes to avoiding hazards, there isn't any position you can stay in that lets you dodge all of them. Don't stay near the catapult when it appears, keep moving to dodge the bombs and don't fall off when the ship is in the storm. The geometry of the ship can create weird interactions with certain objects such as Mario's fireballs and Snake's grenades. One interesting but cheap technique is rudder camping, in which a character with a stall-then-fall down aerial, most notably Mr. Game & Watch, can fall into the water, under the rudder and stay there indefinitely. It is slightly risky as you have to move out when the storm comes, but it lets you avoid most of the fight by staying there. This stage is often Banned in tournaments due to the hazards and rudder camping. Appears after Toon Link is unlocked. 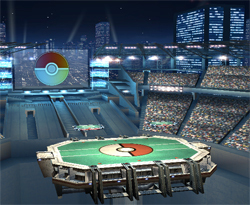 The new Pokémon Stadium is very similar to the Super Smash Bros. Melee stage. The concept and layout is still the same: a main platform with two floating platforms during its neutral state which can change as the stage transforms into a different typing. The transformation of the stage is entirely random, and might occasionally include two same transformations in a row. Before the stage transforms, a symbol of the transformation's typing will be shown on the screen at the back, which lets players anticipate the next layout. Electric: This stage has two smaller platforms on its middle, one floating platform to the left and two conveyor belts running across the stage that moves players toward the edges. 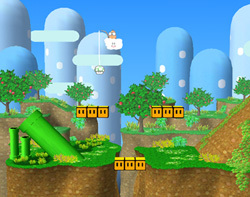 Flying: This stage is one flat main platform that slants at the sides. Gravity is reduced in the air, making characters fall slower. Ground: A mound of dirt occupies most of the left portion of the stage while a building with multiple floors reside to the right. Ice: The ground becomes more slippery, while two platforms appear near the edges that slants toward the middle. When the stage is neutral, the strategy is quite conventional. The platforms can be used to extend combos or to approach projectile users. The transformations are popularly considered to be more extreme than Pokémon Stadium's. The electric type transformation has a very useful feature in that getting pushed off the conveyor belt cancels all lag, so you can perform multiple aerial attacks or a strong but slow smash attack as you reach the edge and have all the endlag cancelled out. 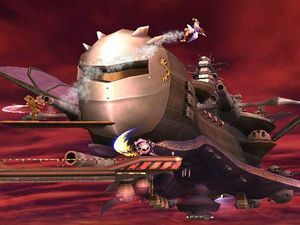 The flying type stage favors aerial characters like Metaknight, who have better aerial attacks and mobility in the air. The right of the dirt mound on the ground transformation creates a wall that can be used in chaingrabs or combos. The ice transformation is probably the least disruptive transformation, as the slippery ground doesn't benefit any character except the Ice Climbers and doesn't negatively affect any too much. This stage's legality in tournaments is quite controversial, being listed as a Counterpick, a Banned or even sometimes a Starter stage, unlike Pokémon Stadium 1. 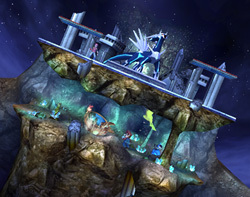 It is argued that the transformations on this stage creates more significant effects, which causes them to be camped out more than the original. This stage is very similar in concept to the Mute City stage in SSBM. 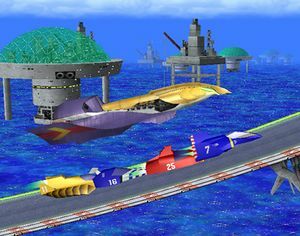 The majority of the stage is on a ledgeless main platform that travels across the Port Town Aero Drive track from F-Zero GX. The platform will make stops at certain locations and drop players off. Unlike its predecessor, the order of the stops are not set, the cars no longer behave the same on every lap. The racecars are obviously the main hazard. They are much faster than the machines in Melee, and pack more power in them too, so it is not only harder to dodge them, but also harder to survive getting hit by them. The ground is also dangerous when the main platform is airborne, as falling on it will do heavy damage and knockback, but it will refresh your midair jumps. Sometimes the platform will come vary close to a wall which also hurts a lot, but will prevent KOs through the left side of the stage. There are multiple locations that the platform stops at, each with their own dangers. Start/Finish line: The stage always begins here, as well as the race. It has no platforms and is completely flat, which makes it difficult to avoid the racecars. Slanted track: This stop has two platforms parallel to the track. The track itself is slanted to the left. Racecars are still a potential hazard, but they won't drive by every time. Aircraft: This stop takes place away from the racetrack above some sort of aircraft. It has three platforms arranged like Battlefield, and is free from racecars. Tower: This stop is set on top of a futuristic structure. There are two platforms to either side of the narrow center platform. The floating disk to the far sides of the stop can be stood on, but you have a high chance of being KOed by a moderately strong projectile. Racecars will not appear here. Gap: A straight line of track with a hole in the middle which characters can fall through and get KOed. Three platforms form a V-shape above the track, the lowest one partially covering the gap. Racecars can appear on this stop but will not cross the middle hole. Steps: A set of tracks arranged like stairs after the huge leap. This stop is flat and considerably larger than all the other stops. Racecars can appear in this section, but they can be anticipated by observing the track in the background. Sharp angle: This section is located right beside a vertical piece of track, and has three platform arranged in a Battlefield-like formation. Racecars can appear from the left, and will hit any player on the lower two platforms. The vertical track will block any attempts to KO to the left side. The racecars can be a bit difficult to dodge, but generally on any section where the racecars come in from behind, you can avoid a majority of them by staying to the left and right edges of the track. You can also try throwing your opponents into the cars, but it is difficult to purposely hit one due to the speed of the cars. Avoid choosing characters that depend on tether recoveries, as the floating platform you will fight on most of the time does not have any ledges. The ground can save you from a meteor smash, but you can still knock your opponents into it for some additional damage. This stage is universally Banned due to the excessively strong hazards and lack of grabbable ledges. This stage is very similar to Icicle Mountain from Super Smash Bros. Melee. Unlike that stage, the stage only ascends, and never descends. The arrangement of platforms throughout the stage is set, looping at the end of the stage ascent. Throughout the stage are switches that toggle platforms, spikes that hurt players and climbable ladders. A "SPEED UP" warning will be randomly displayed during the stage's ascent, making it scroll faster. While it might seem that the camera is panning upwards, it is the stage that is moving downwards, so certain effects can look odd. Pick an aerial character is you want an advantage. You will constantly be climbing the stage, so being able to move through the air fast is a great ability to have. Avoid using characters that rely on tether recoveries, as there are very little grabbable edges here. Try to memorize the layout of the stage, which wouldn't be too hard once you played on it a couple of times. If you aren't familiar with the location of certain hazards, don't move upward too fast, since you might accidentally hit a spike offscreen. Focus on climbing rather than KOing your opponents, since the scrolling stage is more likely to kill you than your opponent's attacks. This stage is universally Banned due to the focus on climbing, the power of the hazards and the advantage it gives to aerial characters. 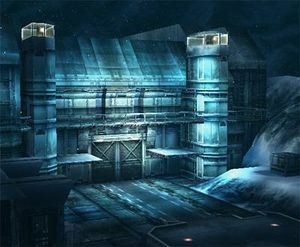 The Metal Gear stage is based on the helipad area of Shadow Moses Island from Metal Gear Solid. This stage is conformed by two destructible towers on either side of the stage. The stage has two floors, the lower one having two smaller platforms jutting out from the walls around the middle of the floor. The walls can be destroyed with enough attacks. Attacking the top half of the tower will only cause half of it to be destroyed, while attacking the bottom half will destroy the whole tower as well as the platform that extends from it. Occasionally, a spotlight will seek out a player and play the iconic discovery sound effect and exclamation mark, but it is only a cosmetic feature. A Metal Gear REX, Metal Gear RAY or Gekko will sometimes destroy the back wall, but they are only a background element that does not affect gameplay. Snake can use his Smash Taunt here to get codec calls with recurring characters in the Metal Gear series (and Slippy Toad) about one of his opponents. The walls in this stage means that you can do certain chaingrabs or infinites, if you don't mind being cheap. King Dedede is especially unfair on this stage when playing 1 on 1, as he can chaingrab certain characters against the wall infinitely or chaingrab them into the blastline when the wall is destroyed. Characters that lack vertical KO moves are at a slight disadvantage on this stage, as characters can only get KOed through the top unless the towers are destroyed. You can use the walls of the tower to make you live longer, by using a well-timed wall tech when knocked into a tower. This stage is universally Banned due to the polarization of matchups and over-centralization of characters with chaingrabs such as King Dedede. 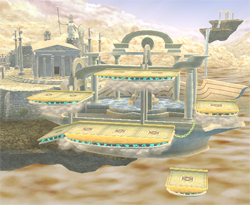 This stage is named after the third world in Kid Icarus, but doesn't resemble any part of that level except the general theme. The main feature of Skyworld is that every platform can be destroyed with attacks, leaving a less solid platform. The destructible platforms cannot be passed through, but the clouds are even softer than most other thin platforms, sometimes letting meteor smashed characters fall straight through! The solid platforms will regenerate after a while. There will occasionally be a horizontally moving platform below the stage that can save characters from falling to their deaths, but anyone standing on it when it moves offscreen will be KOed. The properties of this stage can cause a lot of weird effects and interesting tactics. The solid platforms can let you survive much longer by reducing your knockback after you slam into them from below, but can also lead to your doom by getting you stage-spiked from a diagonal attack. Attacking the solid platforms can extend the duration and range of your attack's hitbox, letting you hit opponents who would otherwise be out of range. The clouds are much more tricky to deal with, primarily because they don't have grabbable ledges, which means that characters with weak or tether recoveries will get edgeguarded very easily. This stage is universally Banned due to circle-camping and the reliance on stage-spikes for KOs. Normally a nice, peaceful, and quiet place, this town is now a Smash Bros. Stage. The changing scenery from day to night (and vice versa) is determined by your Wii's internal clock. The audience in the background will react to events during the match, such as applauding for a player they like when he/she gets a KO. Another feature is that when you play this stage on a Saturday from 8PM to midnight, K. K. Slider will make a special performance will take place behind the stage. It is the smallest stage in the game, making it crowded during free for alls. The stage consists of one main platform and one platform hovering above it that will move left to right. Red balloons will sometimes float by overhead, usually carrying food if they're turned on in options, and can be popped with a single hit to drop their load. Due to the thin main platform, it is quite easy to glide across the bottom of the stage. It is widely considered as the most neutral stage in the game. The moving platform gives just enough to avoid chaingrabbing and projectile camping with good positioning, but still make those tactics viable. It also gives more recovery options and helps players pursuit others during combos. A good advanced technique is platform canceling, which can be performed on the moving platform for some interesting tricks. This stage is universally considered as a Starter stage and is the favourite of a lot of competitive players due to its neutral nature and interesting features with its moving platform. This is the place where you encountered Palkia and Dialga in Pokémon Diamond and Pearl. It features a main platform with two smaller vertically moving platforms to its left and right. A cave is located below the main area. Depending on the tint of the stage, certain legendary Pokemon may appear that can create adverse effects and hazards. When it is blue, Dialga has a chance to appear, while Palkia can appear when it is purplish-pink. Cresselia can also appear despite the tint of the stage. Uxie, Azelf and Mespirit also make cameos on the stage, but will not interfere with the match. Destroys a third of the top part of the stage, creating a path to the cave beneath. Creates a vertical Hyper Beam that covers a third of the stage. Tilts the camera, making everything seem slightly angled. Does not actually affect how characters and objects behave. Slows down the passage of time, similar to the effects of a Timer. Leaps onto the foreground and lets out a damaging roar that knocks players away. A Hyper Beam that covers either the upper or lower level. Completely flips the stage. It is still an illusion, but your controls will be reversed. Mirrors the stage, reversing your left and right controls. Alters the gravity of the stage, causing you to fall slower. Throws multiple damaging Psycho Cuts in a straight line at different angles. Creates a spinning Psycho Cut that will sweep the upper or lower portion of the stage. When it comes to hazards, Dialga's attacks are much less threatening than Palkia's or Cresselia's. While Dialga's attacks are easily avoidable, Palkia can trap you in the cave with its Hyper Beam or cause a lot of confusion by reversing your controls. Cresselia's Psycho Cuts are very powerful projectiles and can KO characters at mid-high percentages. The cave area creates a "Fight Club" area similar to Temple, as the ceiling lets you survive powerful upward attacks, so it is a good idea to hide here if you're heavily damaged. You can also run between the top and bottom sections of the stage if you're a fast character, which can be very frustrating against slower characters. This stage is Banned in all tournaments due to the cave area letting players live to very high percentages. The strong, hard-to-predict hazards and circle-camping is also a contributing factor. This stage is the peak of the Icicle Mountain. It has a solid block of ice in the middle, three normal platforms, one hinging platform, one breakable slanted ice platform, and a slippery floor. It has no grabbable ledges, which puts character that depend on tether recoveries at a disadvantage. Icicles will grow and drop in the small cave area of the stage, meteor smashing players that get hit by it, but it can be destroyed by attacks. The stage starts out high above sea level, with clouds floating by that act as temporary platforms. After a while, the stage will break off of the mountain and slide down it, reducing gravity and causing players to take heavy damage and knockback if they touch the side of the mountain during this period. After that, it will land in the sea, where the swimmable water can save players from getting meteor smashed, but it has a hidden danger. The fish from Balloon Fight will leap out and gobble any character that falls in the water, so players need to get out of it as soon as possible. A polar bear will be present on the iceberg and will frequently stomp it, making the stage sink further. Blocks of ice will float by serving as temporary platforms. Finally, the stage will rise back onto the mountain and repeat the whole cycle again. A cosmetic feature of this stage is that Food that spawn here will resemble the vegetables from the Ice Climber game. Do not pick a character with a tether recovery on this stage, as the main stage lacks and ledge to latch on, meaning that you will easily get edgeguarded whenever the stage is on the mountaintop. The slippery ice will make movement awkward for all characters except Ice Climbers, but you can use that to your advantage by sliding across the ice while charging up smash attacks to surprise enemies. During the iceberg part of the stage, try to meteor smash your opponents into the water to get eaten by the fish, and jump out of it as soon as possible if you fall in there. This stage is universally Banned due to circle-camping, lack of grabbable ledges and the instant-KO fish. Arrow Space: A volley of arrows are launched in the background. Players must dodge the arrows to succeed. Getting hit by the arrows will inflict a ton of damage and knockback to themselve. Blowin' Up: One to three party poppers will appear as well as a blurred image in the background. Players have to attack all the party poppers so that the image comes into full focus. Just setting off one party popper is enough to count as a success, but only if the microgame is completed. Crack Down: A person holding a giant hammer will hit the mountain in the background, causing a quake. Players need to stay in the air to succeed in the microgame, failure to do so will result in getting buried in the ground like getting hit by a Pitfall. Crazy Cars: Players have to jump at the right time to dodge the cars. The car will either dash across the screen normally, do a little leap as they dash or stop for a short while before dashing. Players hit by the car will be launched to the left. Don't Move: Players must not touch anything on the controller except the pause button. Getting hit while in this minigame will start cause the player to win. There's nothing stopping you from charging up a smash attack at your opponents to get an easy KO. Kitty Drop: All players must dodge the rain by staying under the umbrella to succeed in the microgame. Being in the hit will make you take minor damage and no knockback. Lose Your Marble: A stone block appears in the middle of the stage. 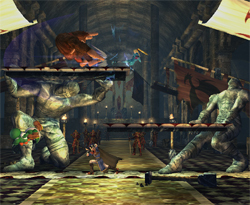 Players must attack the block to chisel a sculpture. If the sculpture is completed, all players that assisted will succeed, but everyone will fail if the sculpture is unfinished. Sole Man: Players will need to dodge a giant foot to avoid getting stimped into the ground. The foot casts a shadow which shows where it will be when it stomps. Taunt: Players are required to taunt around the time the camera flashes to succeed. The general strategy for the stage is similar to other normal, static stages. 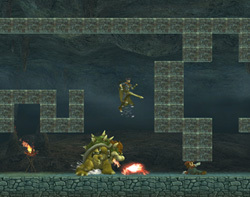 The platforms help with combos, chasing and dodging projectiles. The microgames are also quite easy once you get the hang of it, though they can be a bit unpredictable. Always try your best to win at the microgames to get the bonus effects, though the randomized effects can sometimes mean that your opponent gets invincibility while you get a measly 10% heal. This stage is Banned in most tournaments. While the layout and microgames are perfectly fine for competitive play, the randomness and significant differences of the rewards can randomly give players an unfair disadvantage. The Yoshi's Island stage is based on the pastel-colored crayon-drawn art style used in games like Super Mario World 2 and Yoshi's Island DS. 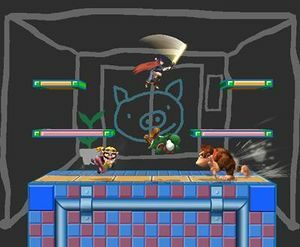 The stage goes through several seasons as the fight drags on, but it has no affect on gameplay. The stage itself consists of one large platform with uneven terrain, which goes right down to the bottom blastline so players can't travel under it. There is one more platform above that tilts, and the Support Ghost will pop up randomly at the left or right edge. Shy Guys will occasionally fly in carrying food items, though they won't carry anything if food is turned off in the options menu. Hitting them will make them drop the items and fly away, though ignoring them for a long time will also make them go away. The uneven geometry of the stage can allow for some interesting strategies. It can sometimes interrupt chaingrabs, while the slants can affect some moves like Kirby's Stone. The tilting platfrom has an interesting feature in that it lets projectiles through if they cross it from the bottom but not from the top side, so players can tilt it one way or another to either shield them from projectiles or help them camp with them. The Shy Guys are a helpful source of healing items and can be used to refresh moves affected by Stale Move Negation. The Support Ghost's appearance can help players recover, but can also do the opposite. Lastly, the walls of the base can be wall jumped from, which can be exploited especially well with characters like Lucario, who can cling to the wall and plan his next move. The stage is universally considered a Starter stage as it doesn't give too much of an advantage to any character. A select number of stages are returning from Super Smash Bros. Melee. 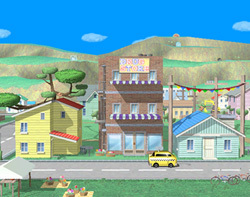 Most of the stages are already available at the start of the game, but some of them must be unlocked. This stage takes place on an actual track, with the fight taking place on top of multiple F-Zero racecars. The vehicles speed along the track at very high speeds, so landing on the track will cause players to be swept to the left very quickly. The Falcon Flyer will serve as an additional floating platform at the start of the stage, and will reappear occasionally. Sometimes the cars will jump over gaps in the track, and falling through the bottom of the stage means instant death in these sections. There will also be smaller floating platforms sometimes, but these are harder to reach. The road is obviously an extremely dangerous place to be, so never stand on it for more than a second or you'll get swept into the left blastline and lose a stock. You can use that to your advantage by knocking opponents on to the track, though they still have a small chance to survive. Since the cars have an awkward shape, it is adviasable for you to use short hops as your main form of movement, since running will make you hit the sides of the cars very often. The floating platforms can be used to camp, since they are quite far from the main stage, letting you predict your opponent's approach. You don't have to worry as much if your character has a bad recovery, since the track will often catch you if you get knocked downwards, but be sure to make it back to the cars quickly. This stage is universally Banned in tournaments because of the moving track and the effectiveness of turtling on the floating platforms. Play 10 Vs. matches as Captain Falcon. Brinstar consists of a fairly odd geometry and some interesting gimmicks to the stage itself. Its main feature is the pool of acid below the stage that will rise and fall, damaging any player that touches it, and it can sometimes cover all the platforms except the highest. The main platform has bumpy geometry and can be passed through from below. The platform is held by some organic material to the right, which can be destroyed with attacks but will slowly regenerate. Destroying that material will split the main platform into two, pulling both sides closer to the blastline. Two platforms are tied to either side of the main platform by a stalk, the left one higher than the right one. The right smaller platform has slanted edges. Destroying the stalks will make the platforms slant toward the outer edge. One final platform rests above all the others, slightly to the left side of the main platform. Like all other stages with one-way pass-through main platforms, Brinstar is susceptible to sharking by aerial characters, which are a pain to counter. The rising acid also generally gives an advantage to aerial characters, since they can remain effective without a lot of fighting ground. The acid can save players edgeguarded or knocked toward the bottom of the stage if the acid level is high enough, but it does deal a lot of damage and knockback and can knock players right into enemy attacks. The awkward terrain of the main platforms means that some recoveries aimed at the edge can miss it and send the user plummeting to their death. The destroyable stage element has an interesting effect on your attacks, in that it will extend the duration and size of your attack hitbox. This can be exploited to extend the range and length of your attack long enough to hit an opponent who could've otherwise dodged it. Brinstar is either seen as a Counterpick stage or is Banned, due to the advantage aerial characters get on the stage. Some tournament organizers consider Rainbow Cruise and Brinstar to be mutually exclusive as counterpicks, so if one is allowed, the other is banned. Brinstar is less popular than Rainbow Cruise, which results in it seeing less use than RC. This nostalgic stage from Melee is quite similar to the layout of Sector Z from the original Super Smash Bros., though it is quite smaller from its N64 counterpart. 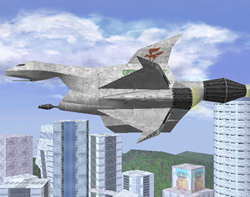 The stage takes place on a shrunken version of the Great Fox, Star Fox's main ship. The tail wing of the ship creates a permanent wall at the right side of the stage. The ship has cannons mounted at the front which can be stood on, but the cannons will occasionally charge up and shoot, resulting in an almost certain KO for any characters standing on it. The cannons will be destroyed after enough damage is dealt to it. Arwings and Wolfens will occasionally fly in and fire shots at players. They also serve as platforms, but they will frequently perform barrel rolls, dropping players off. The right portion of the stage is a notoriously advantageous position, since it is very hard to approach and the wall lets you do long chaingrabs and combos. The arwings shouldn't be too much of a problem to avoid. Your strategy on the stage should be pretty standard. You can camp on the cannons and make it hard to reach you, but you have a high risk of getting KOed if the cannons start charging up. This stage is universally Banned in tournaments due to the tail wing alone. It is just too hard for most characters to approach that position safely, and characters like King Dedede can perform wall infinites, degenerating gameplay. 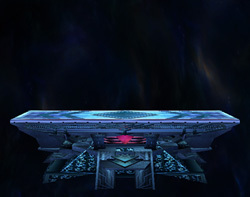 This whimsical stage returning from Melee consists of a main platform with two gaps at each end and two smaller platforms above the main one. Star blocks and bomb blocks will constantly fill the gap between the middle and the edges of the stage, which act as temporary walls. These blocks can be destroyed with attacks, though bomb blocks will explode upong being detroyed, dealing moderate damage and knockback to nearby players. Whispy Woods will occasionally let out a strong blow, which will slowly push players in the direction he is blowing. He can also launch apples that fall on random portions of the stage. Some apples will heal the player while some apples can be picked up and thrown at opponents. It is advisable to play defensively on this stage, unless you don't mind taking a lot of damage. The presence of the blocks makes it difficult to approach opponents on the other side without breaking the blocks or approaching from the air. Breaking the blocks is risky because you might damage yourself with bomb blocks, while an aerial approach can be anticipated and countered by a patient opponent. There are certain moves that can set off bomb blocks without placing you in danger, but you'll usually have to be in a proper position to avoid getting caught in the explosion. You can use bomb blocks to your advantage, purposely setting them off to potentially KO your opponents. This stage is usually Banned in most tournaments, but it is rarely seen as a Counterpick. The difficulty of approaching and the wall of blocks are the main factors that prevent it from being used in tournament play, but some tourney organizers allow it as the problems caused by the blocks can be solved by destroying them. Play 20 Vs. matches as Kirby. This is one of the largest stages in the whole game, second only to New Pork City. It has an interesting arrangement of platforms and a notorious "fight club" area at its bottom section, a term coined by Nintendo Power due to the difficulty of KOing opponents there. Due to the large size of the stage, the blastlines are quite far away around the middle of the stage, while it is uncomfortably close when at the edges of the stage. The stage is mostly unchanged from Melee. 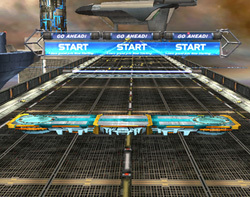 The stage's large size gives a good advantage to fast characters, who can easily outrun their opponents around the map. A good example is Fox, who can rack up bits of damage with his lasers while running away from his enemies, only going for KOs when their health is high enough. Characters who can glide can even move around the stage without landing on any platforms. The bottom area is infamous as it lets players survive powerful attacks at high percentages. The walls and ceiling makes it impossible for upward knockback moves to KO, while it is quite far from the side blastlines. If you have good timing you can even perform a tech as you hit a ceiling, negating all knockback and returning you to a neutral state, making you even harder to KO. If you need to survive, always remember this area. This stage is universally Banned in most tournaments. It gives too much of an advantage to fast characters and has major problems with circle-camping and turtling in the bottom section. Jungle Japes is a fairly basic stage. It consists of three main platforms, seperated by two gaps, with one smaller platform above the middle one. Below the platforms is a river with a strong current that will quickly carry any players that fall in straight to the left blastline and potentially KO them. It is easier to escape the river than in Melee, since characters can now swim in the river. A Klaptrap will swim by approsimately once every 10 seconds, and touching it will instantly KO the player. The stage has a higher top blastline than most stages, giving an advantage to characters with horizontal KO moves. Jungle Japes is fairly flat and quite wide, which makes it great for projectile camping. The slight height differences between the main platforms also makes it difficult to safely approach certain characters, which can be used to your advantage. The river is an obvious hazard, but it can sometimes save characters with poor recoveries by catching them after being meteor smashed, though they must jump out almost immediately to avoid getting pushed to the blastline. Characters like Fox and Falco can use their side specials to quickly pass between platforms, and they can do so underneath the stage without touching the water, making them very difficult to hit. This stage used to be a Counterpick and still is in some tournaments, but it is usually Banned nowadays due to the advantage it gives to projectile characters and overly powerful stage hazards. Play 10 Vs. matches on any SSBM stage. This stage has an odd arrangement of platforms made up of the roofs of houses, the tree branches baside the left house, the awnings of the drug store and the line of flags above the right house. The houses create permanent walls, meaning that it is difficult for horizontal knockback moves to KO at the middle area. The stage has walkoffs to the left and right. The awnings of the drug store will occasionally collapse, making them unable to be stood on. Cars will frequently drive by after a short warning, damaging and knocking back players in their path, but they are much weaker than in Melee. Note that there are slight protrusions at the roof of the right house, meaning that players below the roof can't jump away from the cars when they're in that position. The main hazard of the stage is the vehicles that pass by, but since their appearance is announced rather early, you have plenty of time to avoid it, though you can knock opponents into them for some extra damage. The walls in this stage can let you perform wall combos and even infinites with certain characters, but it is usually considered cheap to do so. The walkoffs are a risky but effective location to camp, because you can grab anyone who tries to attack you and throw them into the blastline for a free KO. It is more effective on this stage than others because the houses forces foes to approach predictably from above, but the cars can jeopardize your efforts. This stage is universally Banned due to the disruptive nature of the cars, the presence of permanent walls and walkoff camping. Some arguments have been made about its legality, stating that the cars lessen the threat of the walls and walkoff camping, but it is still rarely seen in tourneys. Fire: This stage consists of a burnt tree that act as two platforms and seperates the stage in to two sections. The roof of the right house acts as a platform, and there is a slight indentation in the center. Rock: A huge rock wall takes up most of the left portion in this transformation, while a bunch of oddly arranged platforms are present in the middle-right. Water: This stage possesses a windmill which consists of multiple moving platforms. Characters can often get trapped in the windmill blades easily. There are two platforms held up by water spouts which will change their vertical position from time to time. Grass: This stage has very uneven terrain and a fairly ordinary arrangement of platforms. It is arguably the transformation that affects gameplay the least, as there are no major features that can be exploited. Your strategy on this stage shouldn't be too complicated. The platforms make it easier to approach projectile users. The transformation of the stages will affect certain actions such as interrupting chaingrabs. The fire and rock stage possesses temporary walls which can let you do wall combos and chaingrabs, while their tight spaces also let youtrap your opponents and pressure them with attacks. You can also perform combos and traps with the windmill in the water stage. However, if you don't want to be the target of these combos and traps, it's best to stay where you are when the stage transforms, as the platform arrangement makes it harder for characters to approach you. This stage is usually considered a Starter and occasionally a Counterpick. The shifting terrain keeps fights interesting, but the presence of walls during certain transformations gives some characters a noticeable advantage. Play 10 Vs. matches on the Pokémon Stadium 2 stage. Based off of SM64's 15th course "Rainbow Ride", this stage goes in all four cardinal directions as a forced screen stage. You'll need to constantly move around, as either the elements of the stage, your opponents, or the screen itself may eventually KO you. 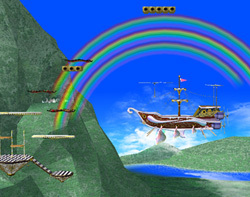 Players will start out on a ship similar to the one seen in Rainbow Ride, which has slightly uneven geometry for its main platform, and elevation to the right and two small platforms on top of each other in the middle. The ship will then crash into a platform and sink, forcing players to go onto an obstacle course full of static platforms, tilting platforms, donut blocks and magic carpets. Donut blocks will fall after being stood on for a while but will regenerate. Magic carpets automatically carry players in a set direction when they're standing on it, but it will dissapear mid-flight if players get off it for too long. Eventually players will reach a pendulum platform which marks the start of the next section of the stage. Now, players will have a continous stretch of ground which can be passed from underneath, with several floating platforms and donut blocks along the way. At the very end of this section, an arrow will appear prompting players to fall downward, landing back on the boat where the cycle begins again. Although it is a moving stage, it moves slow enough that it shouldn't be too much of a problem if you can memorize the overall layout. The ship has a temporary wall which can be used to perform wall-infinites and chaingrabs. The platforming section favors aerial characters who can jump around the platforms and attack with ease. Once you reach the topmost section, the nature of the main platform lets certain characters like Metaknight shark from below the platform, which is difficult to deal with. 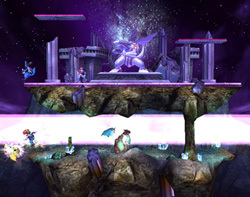 There are also some walls for infinites, but the stage moves too fast for you to get a worthwhile chain on an opponent. Overall, you want to pick an aerial character when fighting on this stage, as ground-based characters will be at an obvious disadvantage. This stage's legality is very controversial, being either a Counterpick or a Banned stage. It gives aerial characters like Metaknight a very significant advantage. Some tournament organizers consider Brinstar and Rainbow Cruise to be mutually-exclusive as they benefit similar characters, so if one is allowed, don't expect to see the other. 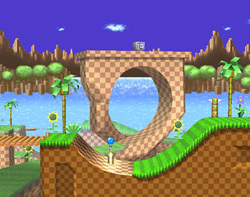 Unlike its counterpart in Brawl, this stage is based off of Super Mario World and has many elements reminiscent of it. The stage consists of a mostly flat platform with two slopes at the sides, with the right one leading to a walkoff. There a multiple rotating blocks on the stage which normally act as platforms, but attacking it or jumping into it will cause it to spin, making characters fall through them. Two sets of these float in the middle of the stage, while three remaining ones form a bridge over a gap in the center of the stage. This stage is notorious for having very close blastlines, making it easier to KO characters early on it. Due to the low risk of dying through the bottom of the stage, characters with poor recoveries won't have so much trouble here, though it is still possible to get trapped in the gap. The nature of the slope means that certain characters can chaingrab others more easily, sometimes straight into the blastline for an easy KO. This stage is universally Banned due to the closeness of the blastlines and the presence of a walkoff to the right of the stage, which leads to walkoff camping. This page was last edited on 29 December 2015, at 03:44. This page has been accessed 32,951 times.